Hi! 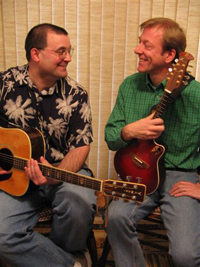 We are Casey Day & Greg Matysik - acoustic musicians from the Madison, Wisconsin area. We are a very eclectic duo known for our tight vocal harmonies and excellent musicianship. We perform music for all ages: general public, kids, and seniors. We sing popular, Irish, and original folk music. We’re glad that you dropped by for a visit. Be sure to view our site for updates on gigs and performances, information on any new CD’s, and comments from people who have seen us before. Finally, if you have the time, we would love to hear from you! Click on our Guest Book and leave us a note. Best wishes and we hope to see you at a performance sometime soon!